G Suite Migration for Microsoft Outlook (GSMMO) is a tool provided by Google that caters to migrate Outlook .pst data file into G Suite account. But when used on their own, it has some issues that overcome by SysTools Outlook to G Suite Migration Tool. Explore here! Why GSMMO Is Not An Ideal Solution? Why Choose Import PST File to G Suite Tool? Message Body Move complete email text with the original information. Mail Attachment Data Contact, Image, Calendar, Documents, Presentation, Hyperlink, Attachment in MSG or EML format. Mail Metadata Attributes Export From, To, Date, Subject, Mailing List, Mailed By information along with email. Folders Deleted Items, Drafts, Inbox, Junk E-mail, Outbox, RSS Feeds, including Nested folders are migrated from Outlook to G Suite or account. 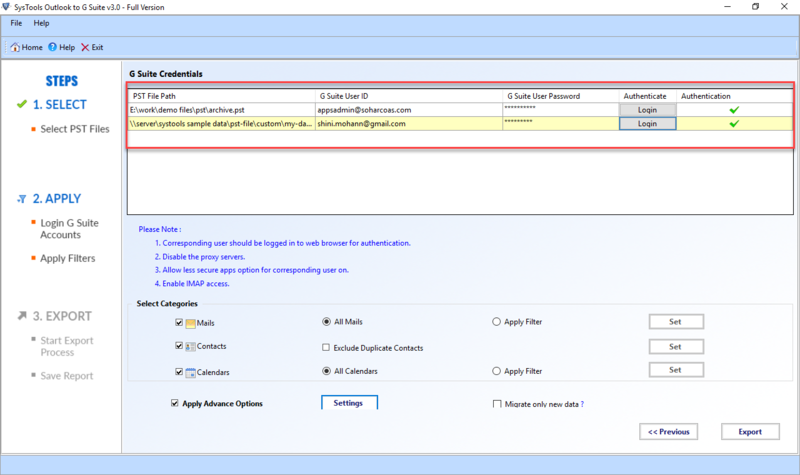 Date Filter Get total control over email migration from Outlook .pst file to Google Apps with the help of date filter. Calendar Export appointments, meetings along with Start Date, Due Date, location, subject, contacts maintained. Outlook to G Suite Migration Tool can migrate multiple Outlook PST files to . Plus, there is an Add Folder option to include multiple PST files at a single time. Moreover, this upload PST to G Suite software smoothly export emails, contacts, calendar entries items from Outlook data file to Google Apps account. It is easy to transfer data of password secured Outlook data file, UNICODE & ANSI PST, and minimum corrupted PST file to single Google account or G Suite users account. Plus, this PST to Google Apps software also supports to migrate Network Drive PST file(s) to G Suite. Outlook Migration Tool for G Suite provides complete transfer of all the email messages from Outlook .pst files to Google Apps account. All the key properties of the email messages such as CC, BCC, TO, FROM, and Subject are retained even after you export PST to G Apps. The G Suite Import software assists users for exporting all the emails along with their corresponding attachments from PST to Google Apps platform. All the attachments whether in the form of images, documents, or hyperlinks remain preserved in G Suite. The tool is enough capable to import Outlook contacts to G Suite with all the information without any fail. All the details like contact name, phone number, email address, company address, etc. are preserved even after importing into desired account. Owing to the importance of calendars in everyday life, the migrate PST to G Suite application ensures that you are capable to export Outlook calendar to Google Apps without Outlook. This Outlook to Migration Tool is capable of processing any size of PST files. It does not have any maximum file size constraint. Users are free to add any size of Outlook data file to this program. Regardless of file size, it will successfully import Outlook PST files to Google Apps/ Personal account. Sometimes, only selective items of PST file is needed to be imported. This PST to G Suite Migrator Tool offers an option to perform such Selective migration. This software allows to select required data items within a PST file by using date filtering option. 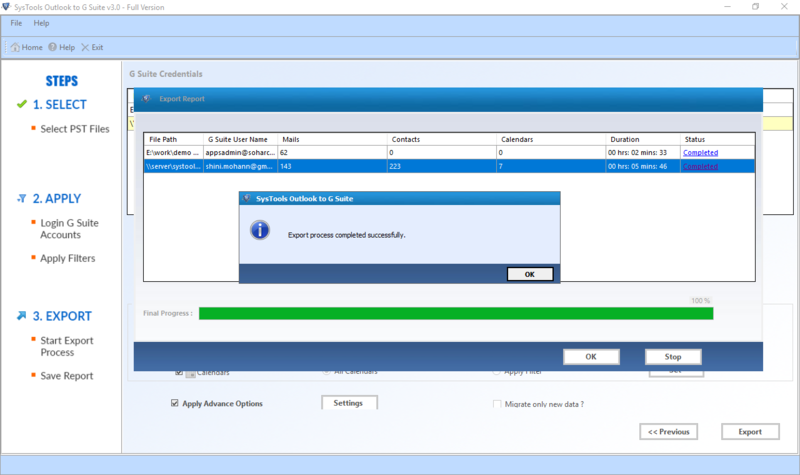 After selecting, the program will only export the selected items within a particular Date Range. This Outlook to G Suite Migration software also provides some Advanced Settings like Excluding Sent Items, Deleted Items or Junk Email. This feature can be beneficial for users who need to export all emails except certain folders like: Sent Items, Deleted Items or Junk Email. This option saves time by migrating desired mails from Outlook data file to Google Apps. Outlook PST to Google Apps Converter offer a very interesting feature named as Export CSV. With this option, it become easy to include or G Suite credential details for multiple PST files. One can need to add Outlook PST and select this option to export CSV file of it. Afterward, open CSV and enter G Suite account details, then click Add CSV from software interface to automatically upload information of Google account information for each .pst file. If users needs to create customized folder on for imported PST File, then this PST to G Suite Migrator Tool will do it. It enables you to import PST emails into separate folders within for easy management of data. You can find these folders on Google Apps with the same name when mapping each folder. For Instance, Inbox folder in Outlook PST can be mapped into Google Apps with "new-Inbox" (as defined by user during mapping). No need to import all the data of Outlook data files into or G Suite account every time. The Outlook to G Suite Migrator software has an option named as Migrate Only New Data that provide the facility of incremental migration. So, whenever you re-import the same PST file, then just opt for the option and migrate only new .pst data into desired or G Apps account. 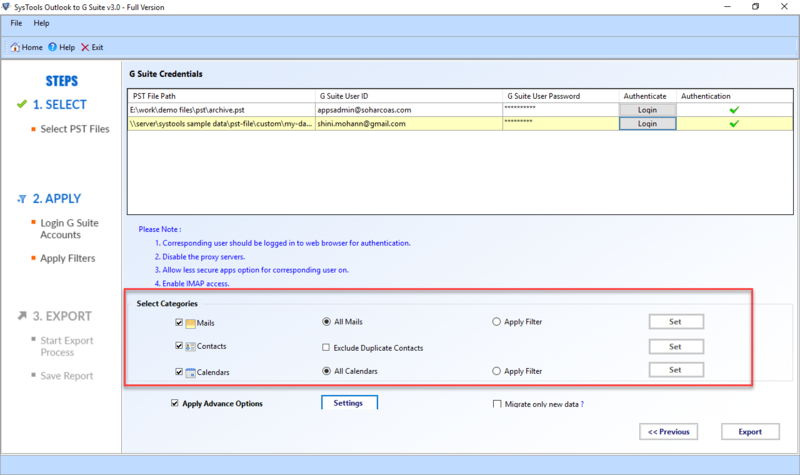 The Outlook to Google Apps Exporter tool offers some of the attachments related filtration option like: Maximum message size (which allows user to enter the Maximum message size manually while exporting emails), Maximum Attachment Size (which allows user to enter the maximum attachment size manually while exporting emails) & Detach Attachment (which allow users to import all emails without attachments). Metadata and folder structure are two important components of PST file. This Outlook to G Suite Migration Tool is determined to keep these components intact. It is equipped with such technology that retains original folder structure and metadata. As a result, users will get the same metadata and folder structure even after uploading PST to Google Apps. Often, users have to pause the operation while the export process is going on. This Outlook to Migration software contains this beneficial feature of Pause/Resume. Using this feature, the on-going procedure can be paused anytime and resumed similarly. It will save users from various inconvenience. Once the data transfer process is over, this Google email uploader application will provide users with a migration report. All details of the export process will be enlisted in that report. Users get benefited from this report as it displays all export information at one place. The report comes in CSV file format. Users can save this file for any future reference. With this utility, one can smoothly move emails, contacts, calendars from any type of PST files into G Suite Basic, G Suite for Business/ Enterprise/ Education, and G Suite Enterprise for Education plan without any fail. Demo of PST to G Suite Migrator software will Export 25 items per folder from PST to Google Apps Account. If you are using Windows 10,8.1,8, 7 or Vista, then please launch the tool as "Run as Administrator"
How to transfer Outlook emails to Google Apps account Via Tool? You need to follow the below instructions to migrate PST to G Suite. 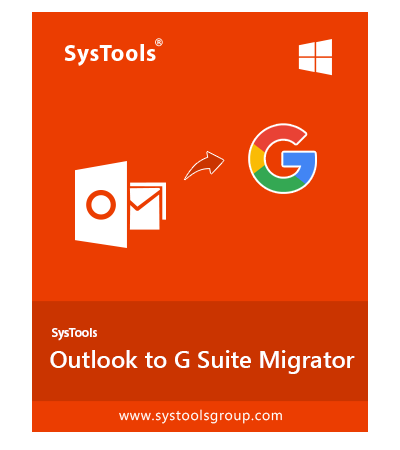 Step 1:– Launch SysTools Outlook to G Suite Migration Tool on Windows machine. Step 2:– Upload PST files using Add File(s) or Add Folder(s)option. Step 3:– Enter G Suite credentials & validate it. Step 4:– Select PST Emails, Contacts & Contacts to import into Google Apps. Step 5:– Apply Filter to export desired Outlook mails, contacts to G Suite account . Step 6:– Hit Export to migrate PST to Google Apps. How to migrate mail from Outlook to Google Apps account in bulk with this PST to G Suite Migrator? Yes, it supports bulk .pst file migration into free or G Suite account. You can upload multiple numbers of Outlook data files together without any hindrance. Can I import ANSI PST files into G Suite for Business plans? Yes, the Outlook to Google Apps Migration tool is capable to import ANSI as well as UNICODE PST file into the desired G Suite plan account. Moreover, the user can also move data items from secured, minimum corrupted, Network PST files. Will my data be completely safe during transfer process? Yes, all your emails, calendars, and contacts data will remain safe and secured while importing Outlook to G Suite. 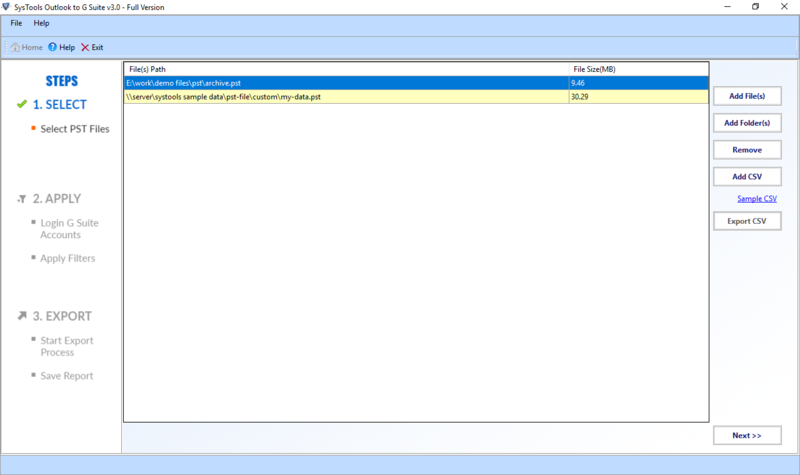 What is maximum file size limit of Outlook data file import by this PST to Google Apps migration tool? It does not have any file size limit. Using this program, you can export any size of Outlook data file into desired or G Suite account. Do I need to have internet connectivity while performing the migration with Outlook to Google Apps utility? Yes, you are required to have a reliable internet connection to export your data from Outlook data file to GApps. Since, Google Apps is a web-based application; you will always require a proper internet connection to perform this task and to access your data after PST to Google Apps export process. Will there be any issue with meta data after exporting Outlook data files? No, there will not be any issue with metadata. Our software is made with latest technology that maintains the source metadata even after you move Outlook to Google Apps. Will the privacy over my personal data be maintained on Google Apps? Since PST to G Suite Migrator Tool is a cloud-based application, your data remains completely secured from any unauthorized access. Anybody who wants to have a look on your data is required to provide the authentic user credentials. Else, no one can get access to your data. I use Mac OS on my system. Will your tool work on my system? No, it will not work on Mac OS systems. Our tool only works on all versions of Windows OS. Is Outlook to G Suite Migration tool capable of transferring selective data items instead of all? Yes, the software provides an option to export only desired data items like emails, calendars from Outlook data file. Do your tool have pause / resume option? Yes, our tool contains pause/resume options while you import Outlook email to Google Apps. You can pause or resume task whenever it is needed. I want to migrate multiple PST files to multiple G Suite accounts. Is it possible with this application? Yes, you can move multiple Outlook PST files to different G Suite account with the help of CSV Option with this PST to Google Apps Migrator. My office handed me over a 5 GB Outlook data file to export into G Suite. Unfortunately, I did not know how to do it. I even asked all my colleagues but could not get any satisfactory solution. One day I came across Outlook to Google Apps Migration Tool. It imported the entire emails from Outlook data file into G Suite account without any trouble. I was in an urgent need to export multiple PST files to account. I have tried manual way, but, it gets failed. Finally, I came to know about Outlook to G Suite Migration Tool. This software solved my problem and transferred all emails from Outlook to . I am glad about its performance. I thank the developers for developing this awesome software.